Phase 2 for the Marvel Cinematic Universe (MCU) has been quite interesting to say the least. First off, we had the very entertaining – yet really polarizing Iron Man 3, and secondly, we had the good but still underwhelming Thor: The Dark World. And while I still reap quite a bit of enjoyment watching these characters in their solo adventures, I feel that there is this feeling of fatigue of these solo films knowing that we have already seen these characters assemble together in one of the most enthralling Summer blockbusters of all-time, and although they are still interesting characters on their own, there’s a sense of desire to see them assemble again. Granted, following up The Avengers is a tough battle to climb, but that shouldn’t stop these films from adding more layers and pushing the superhero film genre. And it is for that reason to why Captain America: The Winter Soldier is not only the best film of Phase 2 of the MCU, it may be the best film overall – with the exception to The Avengers. This film is the first sequel of these standalone films that exceeds its predecessor on virtually every aspect. Captain America: The First Avenger was an enjoyable war film injected with the signature Marvel blood. It served as a well-done origin story to Cap and definitely set up The Avengers well. However, The Winter Soldier just takes the best elements of its predecessor and takes them all to just another level of pure blockbuster excellence. Anthony and Joe Russo take over Joe Johnston’s directing chair and passionately created a great adaptation of the character of Steve Rogers. When I first heard that these two were set to direct this film, I was thinking that this was an odd choice knowing these two mainly from having writing contributions two of my favorite sitcoms, Arrested Development and Community. But from watching this film, I no longer doubt their sensibilities behind the camera, knowing that these two not only know how to create a brilliant final product, but are also able to show love and respect to the fans – much like what Community has also done for appeasing its fans (there’s also a great nod to Community fans in this film). Chris Evans has always been excellent as our titular character, giving amazing sensibilities in his sequences that demand his physical prowess, and more importantly his lovable attitude. He perfectly embodies Steve Rogers’ patriotism and well-being to a tee. Scarlett Johansson as Natasha Romanoff/Black Widow is also terrific in her most complex role as this character. In this film more than any other, she proves to all the naysayers why she is a vital member of The Avengers and truly takes this role as her own. The back-and-forth between these two characters showcases some of the best chemistry that we have seen in the MCU. Also, Samuel L. Jackson is finally given more to do as Nick Fury as he plays quite an integral role to the film’s story. Also, numerous newcomers from Anthony Mackie as Sam Wilson/Falcon and Hollywood icon Robert Redford both give excellence in their roles throughout the film. But where this film truly shines is the way this film not only transcends the superhero genre, but also how it brings Steve Rogers to his most vulnerable state he has been in. First off, this film isn’t your typical superhero film. In fact, it’s very much an espionage/political thriller that happens to have enough action to satiate your appetite. And thankfully, these non-conventional aspects are just as entertaining, if not more so than the action sequences which are enthralling to see. But it is through The Winter Soldier’s story that truly elevates this film from a great comic book film to something quite special in this MCU. The character of The Winter Soldier poses a threat to Steve Rogers not only in the physical side of things, but more importantly through the personal side. Without giving much away, when the film explores the threat that the antagonist brings, it rings through our minds that this is truly the toughest situation that we see Cap face in these films. It’s personal, thought-provoking, and gives quite an emotional pull-off for the character that is the most satisfying we have seen him experience. The Winter Soldier is the in my mind the best standalone film in the MCU, even beating out the original Iron Man. With terrific performances by its ensemble, impeccable direction by the Russo Bros, mind-boggling action setpieces, and an incredible watermark on Steve Rogers’ character, it is definitely one that all fans need to see. And by the way, the two scenes during the credits will only make you even more excited for Avengers: Age of Ultron. With the 86th Annual Academy Awards presented live tomorrow night, film aficionados left-and-right are preparing themselves for the biggest night in Hollywood. Whether it is through catching up on the nominees, preparing their parties, and of course, making their predictions. To film buffs, the Oscars is the equivalent of the Super Bowl – with people sitting in front of their TV’s hootin’ and hollerin’ about who will be taking home the coveted gold statue honoring their work within an entire year of cinema. So without further ado, here is Green Ark Reviews’ First official Oscar Predictions. I will be putting focus on the 8 major categories. John Ridley’s screenplay adaptation of Solomon Northup’s inspiring memoir holds a considerable frontrunner status over the other nominees. Sure Captain Phillips took home the WGA but in that category, Ridley’s screenplay wasn’t eligible for a nomination. If there is a sure-fire category that 12 Years a Slave is emerging victorious with, it is this one. Unlike the race for Best Adapted Screenplay, this category is definitely in a dead-heat two-horse race between American Hustle and Her. For a while, Spike Jonze’s script has been keeping a consistent lead over Singer and Russell’s script throughout the entire award season. Her has been gifted with countless accolades from critics groups nationwide and also had taken both the Golden Globe and WGA. However, because of American Hustle’s 10 nominations, it seems that the Academy wants to award it some way and this category (along with another to be discussed in a moment) seems to be a good fit. Also, this is a way to award David O. Russell who has 0 Oscars at the moment after three consecutive films. The race may be in a dead-heat, but I still think Spike Jonze will be the one to win. “Original” is the perfect way to describe Her and it is fully deserving of the statue. Similar to the Original Screenplay race, this category is down to two contenders: Lawrence and Nyong’o. While I wouldn’t say it is as neck-and-neck as the previous category, the race is still fairly close. The argument that can be made for Lawrence is her Golden Globe win along with her BAFTA. Not to mention the fact that because the Academy has nominated American Hustle in all four acting categories, it seems plausible that they would want to award at least one of the performances and out of the four, this one seems to have the largest chance at victory. However, Lawrence already won the Lead Actress Oscar last year in Silver Linings Playbook, and it is because of this fact that I feel that Nyong’o is taking home the Oscar. When one watches her scenes in 12 Years a Slave, you cannot help but feel such a soul-crushing feeling of sorrow for her character. This performance is too much of an emotional powerhouse that you just have to mark her on your ballot. A new star has been born in Hollywood, and her name is Lupita Nyong’o. I believe that if Fassbender had been campaigning more throughout award season for his performance, he could have a solid chance at being a more considerable threat for the Oscar. He was expected to win BAFTA but interestingly enough, lost to breakout star, Barkhad Abdi. But really, this is one of the sure-fire locks of the night. This is Jared Leto’s award to lose. From the complete physical transformation, to the subject matter surrounding his performance, you cannot deny that this is Leto’s time. And in the same case as Best Supporting Actor, this award is an absolute lock. Cate Blanchett will accept her second Oscar for her unprecedented performance in Blue Jasmine. Not even the recent controversy with Woody Allen and Dylan Farrow will bring her down from this. This is without a doubt, one of the most stacked Best Actor races I can remember in Oscar history. The actors who came up close to receiving a nomination gave such incredible performances as these five listed, but can anyone argue that these performances are not worthy of being on this list? All-in-all, 2013 was a splendid year for leading actor performances, but the way I see this race, I feel that it may be closer than many pundits have been analyzing it as. Ever since his Golden Globe victory, Matthew McConaughey has emerged as the frontrunner in this category taking home the Critic’s Choice, SAG etc. The odds definitely seem to be in his favor from taking home those trophies and to top that all off, this “McConassiance” is only going to continue for years to come. In many ways, this is a way for not just the Academy, but the film industry as a whole to award him for taking his career from being that likable guy in all those romantic comedies, to becoming one of the most prestigious actors in the business right now. But even though the Oscar is going to McConaughey, there are two potential spoilers in this race: Chiwetel Ejiofor and Leonardo DiCaprio. Ejiofor carries the emotional weight of 12 Years a Slave right on his shoulders and with a BAFTA win, he is catching up behind McConaughey. And then, you have DiCaprio – a performance that reaches such incredible versatility that hasn’t been seen from him before. On top of that, this is his fourth acting Oscar nod in his career in a total of 0 wins. The overdue factor definitely boosts his chances up, and despite of all the controversy, the campaign that The Wolf of Wall Street has been working for has peaked at just the right time to give DiCaprio a chance to finally win an Oscar (and possibly put an end to all those internet memes). But overall, I still think McConaughey is winning the Oscar. His role is the kind that just screams “Oscar” with his character dying from AIDS as well as his considerable weight loss. Here’s the thing: when you spend years on a project that boasts technical innovations that not only stimulate the eyes and ears of the audience, but completely set in the next groundbreaking step of the filmmaking medium, then you reach a directing feat. And through the incredible production value, telling a story of survival that focuses mainly on one character through the magic of awe-inspiring visual storytelling is fully deserving of the highest honors. Not only is Alfonso Cuaron going to win, he’s the only choice to win. This is the most nail-biting Best Picture race the Academy has faced in years. And the tension only continues on building as we come closer to the ceremony. But out of all the nominees, two are fighting for the coveted title. Those two films are Gravity and 12 Years a Slave. Both have been receiving countless accolades left and right and for the first time in history, they both tied for Best Picture at the Producer’s Guild Awards. But of the two films, which one is going home with the gold? The argument in Gravity’s favor is that Best Director almost always goes with Best Picture. 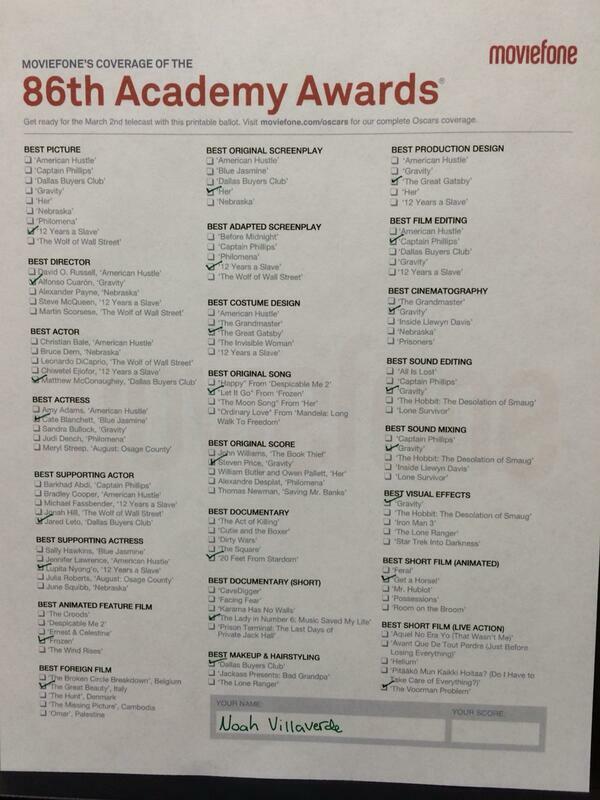 Plus, with all the technical awards that are pretty much in-lock for the film, Gravity definitely has a solid shot. However, is the Academy finally willing to embrace a sci-fi film as the Best Picture of the year? I’m not so sure about that yet, but if any film in Oscar history has the biggest chance at defeating that prejudice, it’s Gravity. Then, we have 12 Years a Slave. The award season for this film has been quite interesting to say the least. It was considered the frontrunner ever since it premiered at the Toronto International Film Festival and was even considered by some as the Schindler’s List of the decade. But is the film simply too hard to watch for some Academy members? This is such a heated race between two completely different in genre, yet both incredible in their message of promoting the human spirit. One is a film that embraces the limitless possibilities the future of filmmaking has to behold, and the other is a film that serves as a harrowing reminder of one of the most shameful time periods that has faced American history. No matter which film between these two is chosen as the Best Picture, the Academy will have chosen a film that embraces the beauty of the human spirit – whether it is through the willingness to survive or the willingness to live, the potential Best Picture winner will be remembered for those reasons above everything else. After getting a sweepstakes letter in the mail believing that he has won $1 million, Woody Grant (Bruce Dern), an aging alcoholic father/husband pleads to his son David (Will Forte) to take him to Lincoln, Nebraska to earn his winnings. Although he believes it is a scam, David reluctantly takes his father on a road trip as a means to reconnect with him knowing that this may be the last time he can share an intimate father-son experience as they embark on a hilarious, yet heartwarming journey spanning four states that also serves as a beautiful portrait of reflecting back at one’s past. When looking at the nine Best Picture nominees, Alexander Payne’s newest film Nebraska doesn’t immediately stand-out in terms of what presence it emotes on the screen. It doesn’t have the innovative visual splendor of Gravity, nor does it have the heart-wrenching historical significance of 12 Years a Slave. It also doesn’t have the euphoric groove of American Hustle, and above all, doesn’t possess the insane drug-addled debauchery that The Wolf of Wall Street has. An outsider may look at this lineup of nominees and quite possibly dismiss “Nebraska” for not looking nearly as exciting or innovating as its other fellow nominees. But what those outside naysayers might not realize is that with this slate of BP nominees, sometimes after sitting through films like the ones mentioned above, it takes a film of such beautiful simplicity to remind us that one does not need a complex story or the premium bells and whistles to make a film worth the investment for. It’s funny that I mention that Nebraska is full of such beautiful simplicity – but that is all from the external view of the film. It is shot beautifully with the black & white cinematography and has characters that may feel somewhat traditional in that facet. And while this may feel like such a small film on that scale, the simplicity really just ends there. Because internally, this film reflects such an emotional complexity that makes these characters that seem simple off of just reading the premise and make them feel so real. And that is a credit thanks to the intimate direction of Payne, the blissfully hilarious screenplay by Bob Nelson, and above all, the remarkable performances by the leads. Bruce Dern gives quite possibly the performance of his life as Woody Grant – giving such complexity as the aging man who you can’t help but love thanks to the perfect amalgam of hilarity and heartbreak his performance promises. Will Forte also gives a remarkably nuanced performance that was definitely snubbed for a Best Supporting Actor nod. It is the relationship between these two that definitely serve as the heart that beats through this film. June Squibb is also irresistibly hysterical as Woody’s overbearing, yet downright caring wife who electrifies the screen every time she appears. And of course, the supporting ensemble that also includes Bob Odenkirk among others all help serve this beautifully intimate portrait of a family that has definitely distanced themselves from eachother over the years. 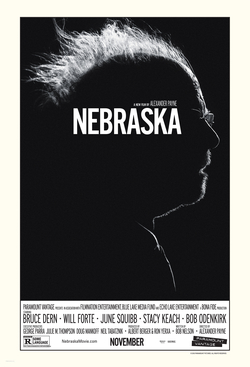 It is refreshing to see a film like Nebraska to come out during this awards season. Not only as a beautiful love letter to the importance of the family dynamic – no matter how dysfunctional, but also as a wonderful tribute to the old days of Hollywood. While this film may take place in a modern-day setting, the black & white cinematography alongside Nelson’s charming screenplay give this film such a timelessness that the films good ol’ Hollywood era had. All-in-all, Nebraska is nothing short of incredible. Well done Payne. Well done. Why is “Frozen” a success? In the final box office weekend of 2013, we found that The Hobbit: The Desolation of Smaug is #1 for the third consecutive week followed by Frozen at #2 both taking in about $29.8 Million and $28.8 Million respectively. But what I find to be truly stunning to see is that Frozen was in its sixth weekend in its domestic release. That’s right, usually for films, it is difficult to keep such a hold consistently every week – even for the more popular blockbusters which soon find themselves earning much of their gross in front-loaded terms only to find themselves in at least a 50% decrease the following weekend. According to Box Office Mojo, the Disney film has remained consistent within its weekend grosses. Although the film in its first weekend earned $243,390, that was in the Disney-owned El Capitan theatre in Hollywood alone. Soon, Thanksgiving weekend came along and during the 5-day period, the film had earned about $93.9 Million and ranking at #2 behind Lionsgate’s The Hunger Games: Catching Fire. The next three weekends follow along, and while Frozen had a decrease of about 53% after Thanksgiving weekend, the film remained consistently leveled during the next two weekends. And now, in a mind-boggling turn of events following new releases during the week of Christmas like The Wolf of Wall Street and The Secret Life of Walter Mitty, Frozen managed to accomplish the following weekend not only earning #2 after the current reigning Hobbit, but in fact gaining an increase of nearly 47% from the previous weekend. From where it stands domestically as of December 30, 2013, it has earned roughly $248,366,000. I think it’s safe to say that the film has been remaining so successful financially mainly due to the enthusiastic response from both critics and audiences alike earning an 89% on Rotten Tomatoes and an A+ on Cinemascore. Not to mention that it is widely viewed to be the frontrunner for Best Animated Feature. But why is everyone responding to the film oh-so highly? Before I delve into what I believe for that case, I would like to say that Frozen is indeed a magnificent film and another home run from the Walt Disney Animation Studios. The voice acting was superb, the animation was top-notch, and the music is truly sublime. And yes, while those do play factors to the film’s attainment of critical and commercial acclaim, I feel that there is more to be explored within those realms. Was it the marketing? Somewhat. It did follow the footsteps of Tangled by not being titled with a princess’ name and emphasizing more on the non-princess characters to appeal more to boys. Marketing does play a huge role in many animated films’ success. Because really, if it weren’t for those yellow minions running everywhere, Despicable Me wouldn’t even be as successful financially. Also, it can be discussed that because of the time of year the film was released as well as the Winter setting, it brought more audiences to fill up the seats because they were ready for the excitement they crave for during the Holiday season. But above all, while the marketing did play a role into the film’s success, I feel that Frozen has amassed its appeal because it truly is Disney’s return to its Renaissance era. Audiences were given a timeless fairy tale that was endearing in all aspects within characters, animation, and music. A film that simultaneously took advantage of the old Disney tropes that we have become accustomed to, but were utilized in such a creative exercise that manages to both pay tribute to the Renaissance era, but also bring something truly refreshing. All of this balances out into a work of art that may be the final step into the beginning of a new era for the studio. If Snow White and the Seven Dwarves represented the beginning of the Middle Ages of Disney and The Little Mermaid that began the Renaissance, it is the journey that slowly started from The Princess and the Frog all the way to Frozen that finally begins the studio’s Reformation.